How can a team lose a game of basketball before the tip-off? They think it. Typically there’s two schools of thought that happen before a game, a desire to win or a fear of losing. The latter mindset is more common than many will admit. 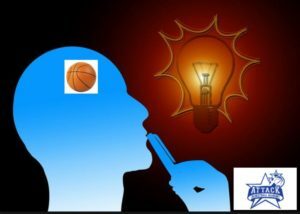 When an opposing team has a better record, taller players, etc., perceived defeat attacks the mind. Negative self-talk drowns out any pep talk your coach may give. Let’s look at 3 common mental mistakes and best practices to employ to overcome them. Emotional drainage can happen when a game is demanding. With a lack of self-confidence, most players live into a reactionary response. They are merely surviving on the court, causing them to revert back to a fearful state of mind. This experience brings self-inflicted offensive turnovers, silly defensive fouls, and indecisions on when to shoot the ball. Basketball is unpredictable, but there are controllables; attitude, effort, preparation, study, to name a few. Top players understand this and use these controllables to boost their confidence in themselves during games. Take a page from their book and use these factors to get re-centered, allowing you to take the game one play at a time. When players carry miscues over from previous possessions or games, mental disasters ensue. Some players become despondent and rude, may talk down to teammates, and become disrespectful to coaches. All they are doing is putting blame onto others instead of taking responsibility for their own actions. The best players play forward. When a play happens, it just a play. They detach themselves from outcomes while staying engaged in the process. They have learned to shed labeling every action they perform as good or bad. The result is that they are focused on being present and getting the most out of the moment. So please stop chasing mistakes! Instead, chase the greatness of the next play. Why? It may be your best play ever. Not paying attention to scouting reports is an easy way to get benched. Scouting reports help with details from the opposing team’s plays to the individual players’ tendencies. Missing assignments on these reports can cost your team valuable possessions. It’s one thing to hear and remember your assignments, but it’s quite another to write them down. Some teams prep as much as 25 hours for one game. How are you to remember all of your duties and responsibilities by memory alone? You can’t!! Having a notebook with you will allow you to take real-time, pertinent notes that will support your overall preparation. Journaling keeps players communicating on and off the court, strategizing about and calling out the go-to moves of opponents to disrupt their game. This level of detail gives players full confidence to play at their highest level because they know beyond a doubt that they are prepared. These best practices support self-confidence in players, even if they are facing a team with a size advantage or a team with a perfect record. They crush negative self-talk, the tendency to chase mistakes, and lack of preparation. Following these best practices allow players to leave past mistakes where they belong…behind them.